MSG, otherwise known as monosodium glutamate, is used as a taste enhancer in many processed foods. It works in an unusual way – by tricking you into tasting more intensely by making your taste buds more sensitive. MSG is found not only in packaged foods you buy at the store, but also in many foods in restaurants. It is probably best known for being found at Chinese restaurants. MSG is dangerous because it is an excitotoxin. This means it kills neurons (brain cells) by exciting them to death! Children, whose brains are still growing, are most at risk. 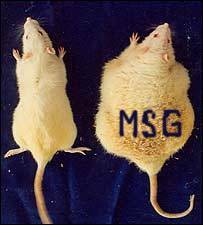 MSG consumed by lab animals causes lesions in the hypothalamus of the brain. Another reason to stay away from MSG is its link to obesity. MSG damages the hypothalamus – this is the area of your brain that controls appetite. This means that your body has no way of telling you when you are full so it becomes easy to overeat. MSG also causes your insulin levels to spike. When your insulin spikes, it causes your blood sugar to drop which in turn makes you feel hungry. Ever notice that you seem hungry soon after eating Chinese food? MSG could be why! MSG can have serious side effects for certain individuals. Some of the adverse reactions associated with MSG include: stomach cramps, migraine headaches, heart palpitations, facial swelling, anxiety, and achiness. MSG is hidden under many other names so it can be tricky to figure out which foods contain MSG. This is especially dangerous for people who are intolerant to MSG, or worse, people who have a severe allergy. It is too bad that the food industry is allowed to disguise certain things under other names to keep the public in the dark. If a product contains one of these ingredients, it contains MSG: glutamate, glutamic acid, monosodium glutamate, monopotassium glutamate, textured protein, hydrolyzed protein, calcium caseinate, sodium caseinate, yeast extract, yeast food, autolyzed yeast, or gelatin. Also, if a food contains any of the following, it OFTEN contains MSG, or creates MSG during processing: artificial flavors, malt extract, corn starch, protein-fortified ingredients, seasonings, soy protein isolate, malt flavoring, carrageenan, citric acid, natural flavors, soy protein, barley malt, maltodextrin, protease, and ultra-pasteurized ingredients. Scary, huh?! In general, the more salty or processed a food is, the more MSG it contains which is another reason to limit processed foods. Eat whole, organic foods whenever possible! This entry was posted in Chemicals/Toxins, Nutrition and tagged glutamate, hypothalamus, monosodium, MSG by Tina's Pharm. Bookmark the permalink. Yes, MSG is everything you say and more. Thanks for speaking up and helping people with knowledge. MSG is the sodium salt of glutamic acid. Glutamic acid is a NATURALLY occurring amino acid found in our bodies. Please explain how adding a sodium to this molecule makes it so toxic? Thanks for you question Alex! All protein contains glutamic acid bound in it, but it’s the free glutamic acid that can cause problems. The glutamic acid is freed from the protein by manufacturing processes. So once MSG is put into our mouths, the saliva causes the sodium and glutamic acid to separate and you have free glutamic acid which is not the same as bound glutamic acid. Only the free form of glutamic acid or glutamates affects glutamate receptors. When bound to other amino acids, there is no stimulation of glutamate receptors. People do not usually have symptoms after ingesting unadulterated protein. Some foods such as Parmesan cheese and tomatoes contain naturally occurring glutamate, but there are no reported reactions to these foods. The difference is bound glutamates in proteins are released slowly during digestion where free glutamate (found in processed foods) enter the bloodstream much faster. Scientists worry that a quick rise in the blood could cause irreversible damage to parts of the brain due to overstimulation. High blood glutamate levels in rodents has been linked to neurotoxicity. Free glutamic acid is the same neurotransmitter that your brain, nervous system, eyes, pancreas and other organs use to initiate certain processes in your body – but that’s part of the problem! The body used the amino acid glutamate as a nerve impulse transmitter in the brain. There are glutamate-responsive tissues in other parts of your body as well. Glutamic acid is a non-essential amino acid, meaning it is something that we do not need to obtain from our diet, we make it ourselves. When you eat MSG, you are introducing more free glutamic acid into your body to react with these glutamate-responsive tissues and over excite them. Since glutamic acid is an excitatory neurotransmitter, high doses can overexcite the brain. Abnormal functioning glutamate receptors have been linked to neurological diseases such as Alzheimer’s. I have even read research indicating glutamate receptors are within your heart’s electrical conduction system and in the heart muscle. This means MSG can damage your heart and may even be linked to sudden deaths in young athletes. (Athletes are more likely to have low magnesium levels making their glutamate receptors more sensitive so they can be affected by lower levels of excitotoxins). Manufactured glutamate added to foods is not the same as naturally occurring glutamate. There are contaminants in processed MSG. Processed MSG contains not only the glutamate your body recognizes, but also the mirror image amino acid structures which your body does not recognize as the same. We don’t exactly know what type of problems this may cause. As mentioned, the natural glutamate that our bodies do recognize is also a problem since glutamate in its free form acts as a neurotransmitter and can overexcite the brain. Are there any studies backing up what you are saying in this post or your responses? So far every source I have checked about the “dangers” of msg has no actual proof that it is bad for you, only speculation. Thanks for the question Martin. Many of the earlier studies were done by Dr. Olney. Here is link summarizing some of these studies and giving references: http://www.truthinlabeling.org/Brain.html.